Aqua [Water], Cetearyl alcohol, Behentrimonium chloride, Cetrimonium chloride, Amodimethicone, Cetyl esters, Phenoxyethanol, Caprylic/capric triglyceride, Linum usitatissimum (Linseed) seed oil, Parfum [Fragrance], Panthenol, Astrocaryum murumuru seed butter [Astrocaryum murumuru butter], Citric acid, Ethylhexylglycerin, Quaternium-95, Arginine, Tocopherol, Butylene glycol, Glycerin, Limonene, Propanediol, Hexyl cinnamal, Helianthus annuus (Sunflower) seed extract, Hydrolyzed quinoa, BHT, PEG-8, Hydrolyzed vegetable protein PG-propyl silanetriol, Citral, Linalool, PEG-8/SMDI copolymer, Palmitoyl myristyl serinate, Sodium polyacrylate. 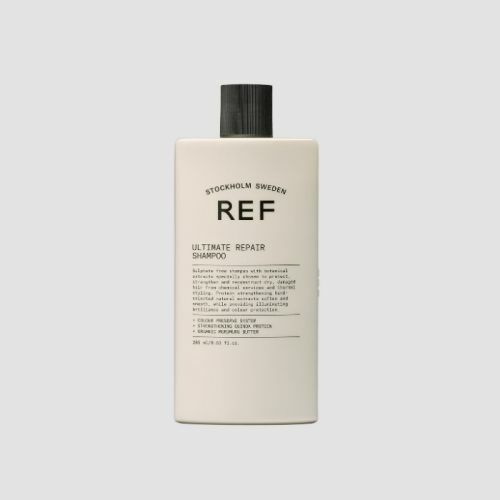 Massage Repair Conditioner into clean, wet hair. Leave for 90 seconds then rinse. If the hair is very dry, apply Repair Conditioner and leave it on for 10 minutes to give it instant vitality. Great conditioner, combed through leaves the hair feeling awesome! I've tried numerous sulphate free shampoo's and conditioners for my fusion hair extensions and this brand is BY FAR the best i have ever used! Others (expensive and cheap brands) made my hair very heavy, greasy and feeling like i had left product in but this has been my life saviour. My hair and extensions are silky soft and i get so many compliments! I have naturally quite thick and frizzy hair but this repair shampoo and conditioner takes all of the frizz out of it which is just what i was after! Could not be without it now and the delivery is always so quick :-) THANK YOU!!! My hairdresser recommended this Conditioner to me. I have fine hair with blonde tips and go to the beach quite a lot. All this took a toll on my hair and this conditioner makes it silky and smooth again. Love it !! !